The staff of the Women’s Fund of Omaha gather with Aly Raisman at the Lead the Change luncheon. Photo courtesy of Thomas Grady. 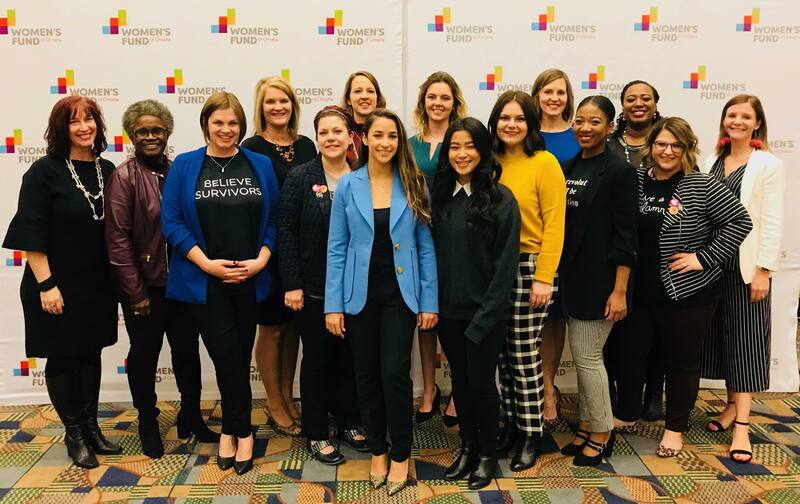 The Women’s Fund of Omaha, a nonprofit organization dedicated to “working on the most critical challenges facing women and girls,” welcomed athlete and activist Aly Raisman for their annual Lead the Change luncheon and celebration. Raisman spoke about her experiences with sexual abuse as a young gymnast, referencing her well-known case against Larry Nassar and USA Gymnastics with WFO executive director Michelle Zych. On Thursday, Oct. 25, at the CHI Health Center Omaha, Raisman had a captive audience. Raisman also discussed the importance of education as a launch pad to end sexual abuse, assault and exploitation for children and adults. Her advocacy in the athletic and activist communities has led Raisman to a deeper understanding of herself and her experiences, she said. That perception influenced her to partner with Darkness to Light to launch her Flip the Switch campaign, an initiative designed to educate adults about the safety of children, aiming to end child sexual abuse on a grassroots level. Flip the Switch offers a free training session to anyone interested in protecting children and learning more about the issue of sexual abuse. In addition to Raisman’s appearance, the WFO gathered with leaders and businesses across the city to celebrate their most productive year yet. For the first time in their 28-year history, they awarded more than $10.5 million in grants to community organizations that align with their mission. This year’s grant funding brings their total historical fiscal contributions to approximately $26 million. This mission is seen in their ongoing commitment to challenging the oppressive norms facing Omaha’s women and girls in economic security, freedom from violence, sexual literacy and leadership. Okina Tran, UNO junior and Marian Ivers intern at WFO, has been with the organization for less than a year, but still says her life has been changed by her involvement. In order to provide such opportunities, events like this are the lifeblood of WFO. Attendees were invited to donate throughout the event, and with nearly 1500 businesses and community leaders in attendance, the course of change will run even more quickly. “The money donated today helps to support our work to identify issues through research, provide grants to local organizations and lead dynamic change by advocating for effective policy solutions,” Heggen said. It was not only in the checks written and envelopes sealed that community members expressed their gratitude for the work of WFO, but in their quiet hums of agreement and uproarious applause during Raisman’s talk, affirming the deep belief in this cause. To learn more about the Women’s Fund or donate to their initiatives, visit omahawomensfund.org. To learn more about Aly Raisman’s education project, visit fliptheswitchcampaign.org.